Note: Quantity of rice flour and vegetables depends on number of eaters. Quantity of green chillies depends on tolerance of taste buds. Add rice flour and salt to this mixture till it becomes a soft dough. vegetables will be enough to form the dough. Knead the dough a little bit to mix properly and shape it into small balls. Spray a non-stick pan with some cooking spray or coat it with a few drops of oil. Place one small ball on the pan and slowly press it into a round-shaped “rotti”. Place this pan on the stove under medium heat. When the rotti gets cooked (it changes color from white to golden brown), turn it over with a non-stick handle. This part is a bit tricky because the rotti will stick to the pan if the non-stick has worn off or there isn’t enough oil coated on the pan. 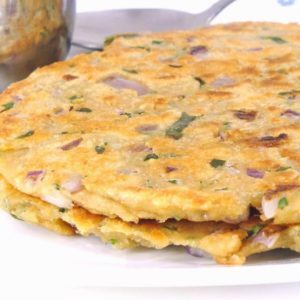 Remove the rotti from the pan, serve hot with pickle, chutney, sugar or spicy powder and butter/ghee. Have a few non-stick pans ready so that you don’t have to wait till this pan cools down. 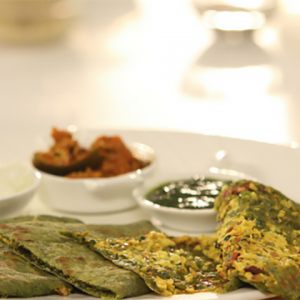 Feel free to comment or share your thoughts on this Veggi Roti Recipe from Awesome Cuisine.